Whoa. Hello. It has been far too long since I posted anything. What's the deal with that? I don't know. Let me get back into the swing of things by telling you about a delicious soup that I made on Sunday. I found the recipe on realsimple.com recently and it sounded delicious. 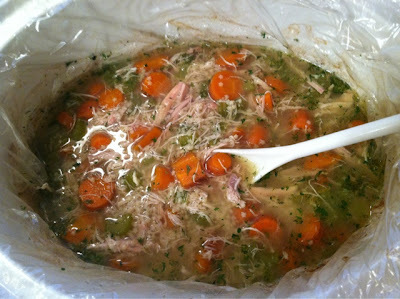 Plus, I hadn't made any chicken soup yet this winter and that is a tragedy. A TRAGEDY. So when I woke up on Sunday, I threw all of the required ingredients together in the crock. Later on I left to go have lunch with Jamie and the Duck which was a really fun time. The Duck, as always kept me entertained. When I got home, the house smelled so. good. Boyfriend was feeling tortured because he had to be around, smelling this good soup smell, and he couldn't even eat it. Poor guy.